Zipping through the year like nobody's business... A major local event to start the month off at the Chinnor & Princes Risborough Railway. Click on the large image on the right to take you to a full screen picture and you can scroll through from there with the left and right arrows. Leave the cursor still for a couple of seconds and the various "tools" disappear until the cursor is moved again. Exit from that screen back to this screen via the "X" in the top right. 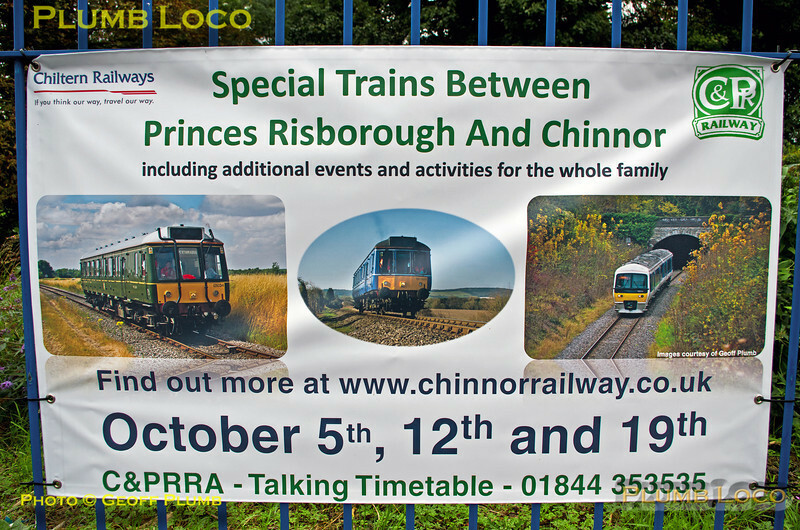 This poster advertising the special Chinnor weekends adorned the platform railings at Princes Risborough station for some time - Chiltern Railways had asked me for some images suitable to illustrate the event and I was very pleased to see what they had done with them - including acknowledging the source of the photos - thanks! Friday 4th October 2013. Digital Image No. IGMP1139.